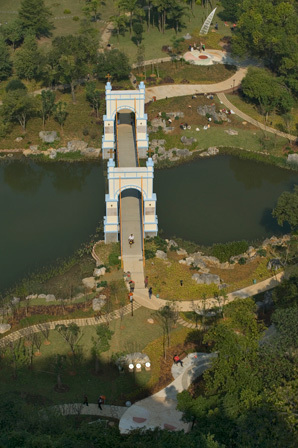 Four thematic designs were sent to Liuzhou, China, for application on 4’ x 4’ copper panels, and attachment to the foundation arches of the Friendship Bridge in Longtan Park’s Cincinnati-Liuzhou Friendship Garden. Described are the first life forms in the Ohio River Valley including Cincinnatian Era fossils, native plants and motifs created by the Adena and Hopewell peoples. 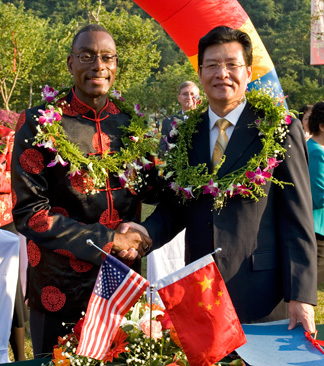 Mayor Mark Mallory of Cincinnati re-signs a memo of understanding that promises continuation of the Cincinnati-Liuzhou relationship in the context of the Cin-Liu Sister City committee. 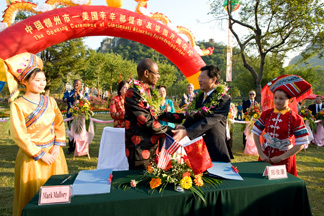 The mayors in celebratory regalia, with Cincinnati mayor in an honorary custom made Ming jacket, and Liuzhou in his typical Western business suit. 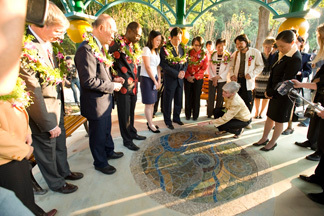 Jan formally presents the mosaic to the mayors and delegation leaders. 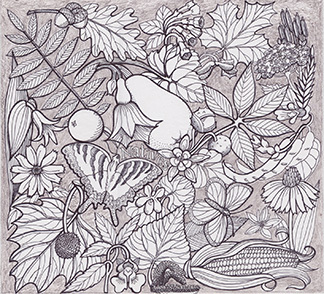 The image is based on an aerial view of Cincinnati with stamped symbols representing the lifestyle and nature of the land use in each neighborhood. 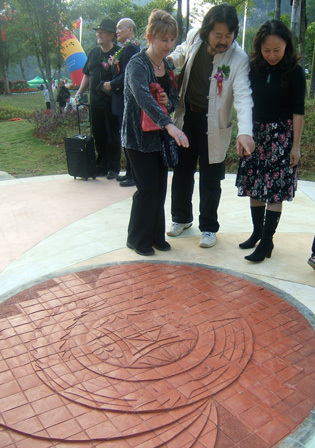 Cincinnati exchange artist Terri Kern and Shelly Han, graduate of Cin-Liu Teachers of English program, ask questions of He Zhenhai at his plaza mosaic, a design that features two flying phoenix in the style of the minority peoples of Guangxi Province. 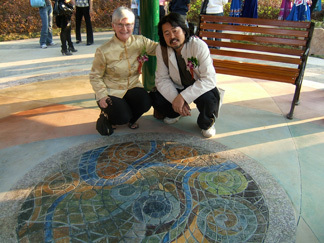 Jan’s mosaic inlay embellishes the pavement under the gazebo in the Cincinnati wing of the Friendship Garden. 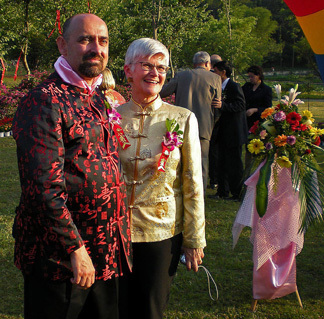 The mini-Roebling Bridge is in the background. 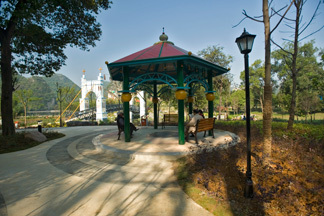 A climb to the peak of Crouching Tiger Mountain reveals the forms of the dragon head and neck (upper) and queen’s face (lower, inverted) connected by the bridge of friendship which spans the waters. 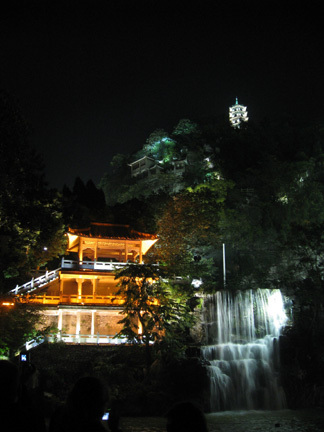 Liuzhou’s spectacular development of a mile long cascade and glowing cityscape proved to be an inspiration to Cincinnati city leaders, like so many other interesting and avant garde features of our Sister City. Cincinnati is known throughout the world for the abundant and beautiful fossils found in limestone and shale sediments left on the sea floor during the Ordovician Period, about 450 million years ago—220 million years before the dinosaurs lived. 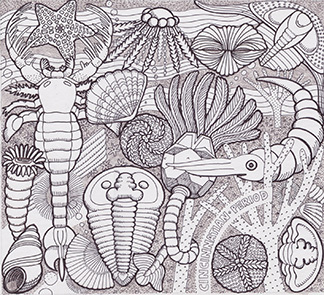 The shallow sea that covered much of what is now the North American continent was filled with marine life - trilobites, bryozoans, brachiopods, mollusks, echinoderms, and graptolites. So famous are these Ordovician fossils and rocks of the Cincinnati region that geologists use the term "Cincinnatian" for strata of the same age all over North America. The Adena people were mound builders and Ohio’s first farmers, living in villages where they supplemented their food sources with hunting abundant wildlife and gathering fruits and seeds from native plants. Their rich cultural and spiritual life is communicated to us through the stone, copper and pottery objects discovered within their mounds. The most famous of these ceremonial structures is the Serpent Mound in Adams County. The Hopewell people, also settled farmers, grew out of the Adena culture. 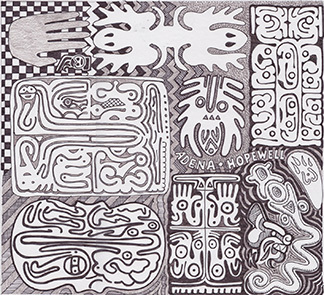 Their concern for the welfare of the dead is expressed through symbolic diagrams engraved on clay and stone tablets, depicting sacred animals and a world of upper and lower realms. The Ohio River brought the earliest east coast immigrants to Losantiville, the name first given to Cincinnati. John Cleves Symmes led 60 persons and 14 four-horse wagons into lands inhabited by the Miami, Shawnee, Wyandot and Delaware natives. When Fort Washington was established in 1789, the trust in additional military security increased the flow of settlers who arrived by flatboats and keelboats. 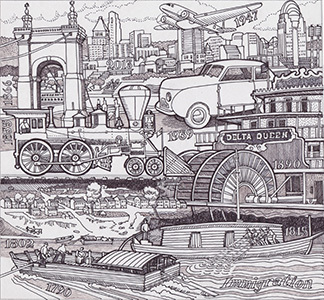 Steamboats ruled the rivers for decades, until farther-reaching railroad systems overtook water traffic. When automobiles became dominant in the 20th century, Powell Crosley’s lightweight automobile offered an energy-efficient option to the larger and heavier models out of Detroit.